In order to clarify the pathogenic mechanism of obesity-related diseases such as type 2 diabetes, hypertension and atherosclerosis, Dr. Matsuzawa has been working on adipocyte function by analyzing the expressed genes in these cells which had been long considered to have only the function storing excess energy as triglyceride. He revealed that adipocytes express abundantly the genes encoding secretary proteins most of which are important bioactive substances including growth factors, complements and cytokines and he established the concept that adipose tissue is one of endocrine organs secreting so-called adipocytokines. He also discovered a novel adipocytokine, “adiponectin”, which has anti-diabetic, anti-inflammatory and antiatherosclerotic properties. 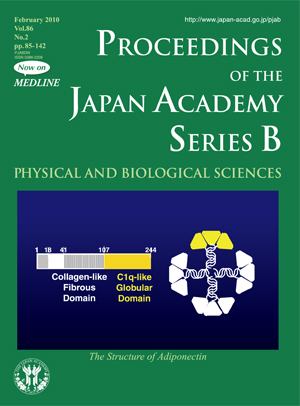 Adiponectin has collagen-like fibrous domain and C1q-like globular domain and is present in the human plasma at a very high concentration going up to 10–15 mg/ml in a unique polymerized form. The production of this protein is paradoxically decreased in obesity, especially visceral obesity. He demonstrated that hypoadiponectinemia is associated with a variety of diseases such as metabolic diseases, atherosclerotic diseases, inflammatory diseases and some cancers. In addition to these clinical observations, he studied the molecular mechanism of anti-diabetic, anti-atherogenic, anti-inflammatory and antifibrotic function of adiponectin. His achievement in the clarification of novel adipocyte function and the discovery of adiponectin have opened the possibility to develop new therapeutic strategies to treat a variety of common diseases including type 2 diabetes, cardiovascular disease and inflammatory diseases.